Ask most people what they know about Spanish music and their mind will wander to stereotypical Spanish guitar players and colourful dancers. But there is so much more to Spanish music than this, with its influences stretching far and wide, and even into some of the most popular songs in the charts in recent years. Like the music scene in any country, the spotlight in Spain is shared by numerous genres. Jazz and classical music are very popular, with open-air concerts common in public spaces in the spring and summer evening sunshine. Barcelona’s Magic Fountain of Montjuïc is a spectacular way to enjoy some classical music mixed with modernity, and a light and water show best enjoyed at dusk for maximum effect. 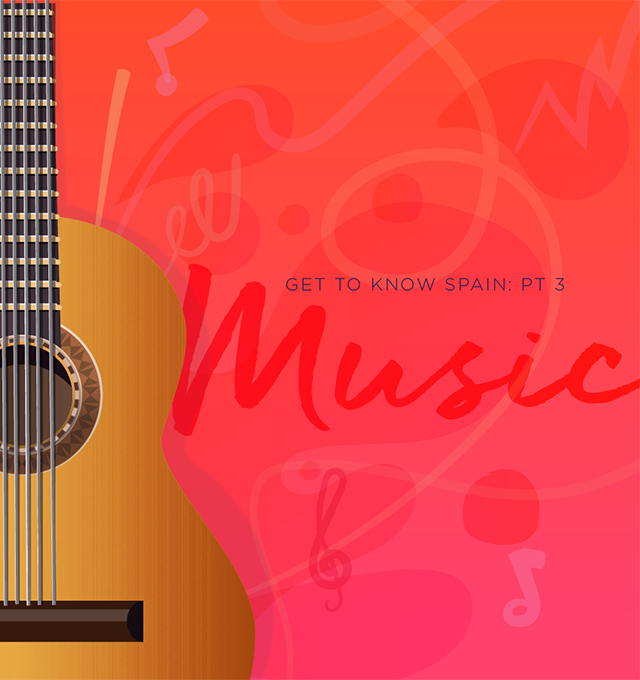 Flamenco music is a style more famous for its extravagant and provocative dance routines, and is the most likely to be on show in tourist areas. It wasn’t until the 80’s that pop music and rock and roll really took off in Spain and Western influences gave rise to new waves of stars. Spain has many famous stars recognisable world-wide. “The King of Latin Pop”, better known as Enrique Iglesias, is one of Spain’s most famous exports and viewed as a national treasure. His rise in the 90s saw him have a huge hit with "Hero" and perform with stars such as Lionel Ritchie and Whitney Houston. He is currently on tour in Europe and whilst there are no Spanish locations left, tickets for UK dates are still available for those interested. His father, Julio, is also the highest-selling Spanish artist of all time, and is still active aged 74! (Did we mention that both are Grammy winners?) Obviously, something in the genes. Ricky Martin is also a very popular artist with a similar style, however is actually of Puerto Rican descent but did gain Spanish citizenship in 2011. Spanish music has had a major influence on the music scene worldwide, with many Spanish and Portuguese speaking countries falling collectively under the Latin music bracket. This includes many South American countries and areas of the Caribbean. Some renowned artists use the Spanish language or dialects in their music, such as Shakira, Pitbull and of course everyone’s favourite artist Luis Fonsi! (You may know him from his hit, "Despacito".) Songs of this nature are enjoyed in bars and nightclubs not just in Spain but worldwide, with Spanish language lyrics becoming a go-to to add a spot of flair and vibrancy into a track. Speaking of vibrancy… Spanish festival season falls during the same period as its British counterpart, with the rain and mud not being as big of an issue as it is here in the UK. For Dance music aficionados, DGTL Barcelona, the Barcelona Beach Festival or A Summer Story in Madrid sees some of the world’s biggest DJ’s perform. The Azkena Rock Festival in Vitoria-Gasteiz is a good shout for those who like things a bit heavier, whilst Primavera Sound and Festival Internacional de Benicassim offer more traditional festival line-ups of the year’s biggest artists. For those who want to try something altogether different/chill, try Rototom Sunsplash, Europe’s biggest Reggae Festival! Again, Spain caters to all tastes and truly has something for everyone. If you’d like to experience the Spanish music scene first-hand by buying your dream home in Spain, get in touch with our Spanish property experts on 0800 011 2639 to discuss your options. Check back next time to learn more about Spanish culture and the Spanish lifestyle, and check out our previous posts in this series on Spanish food and drink, and the top ten facts about Spanish culture.